Fragrances are something that I think will always make such a classic gift at Christmas time. They're something that everyone will use and love which makes the perfect quick and easy gift idea. From the most luxurious, to something more affordable, there is always a fragrance to suit your budget! What's even better is at this time of year, you'll find you can often pick up your favourite fragrances at the best value as they usually can be found in a great gift set with some little extras! Now of course, you don't need me to tell you how many fabulous perfumes and gift sets there are on the market currently, and it would be impossible for me to list them all without this post being hundreds of pages long, buuuut I have rounded up my top picks below which I think cover a range of different prices. So hopefully you can find your perfect fragrance gift below! It wouldn't be a gift guide if I didn't include a Marc Jacobs fragrance would it? 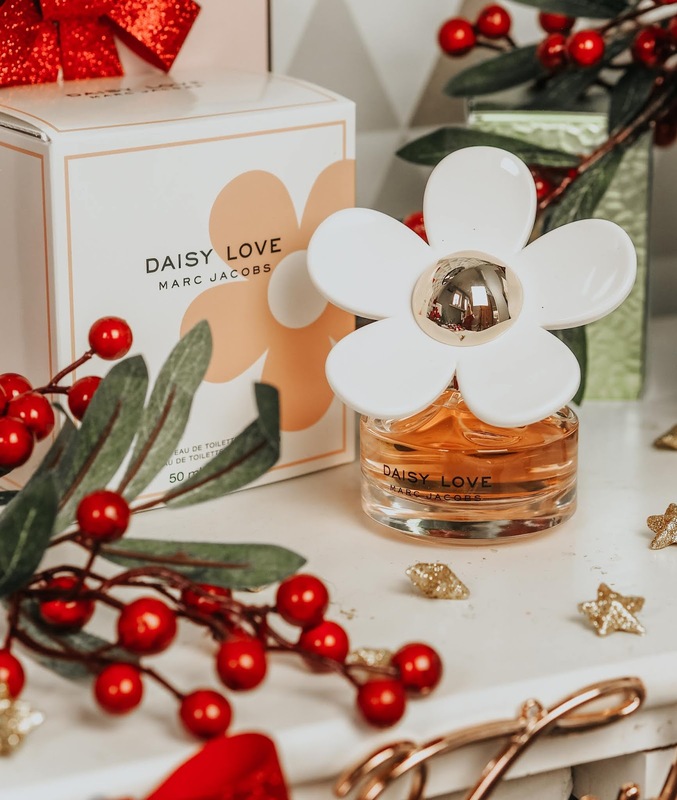 If you know me at all, then you know my all time FAVE fragrance is Marc Jacobs Honey, so I was so excited to try out their latest fragrance Marc Jacobs Daisy Love which retails for £55. I have to say this is definitely up there with Honey as being my favourite Marc Jacobs scents. This fragrance is delicate, feminine and sweet with notes of Cloudberries, Daisy Tree Petals, and Cashmere Musk. Honestly, this is a fragrance I think everyone would love, and Marc Jacobs always get it right when it comes to their gorgeous packaging designs! Ted Baker in my opinion kill it every year with all their gift sets! From the packaging to their scents, it's clear how much thought they put into their products. 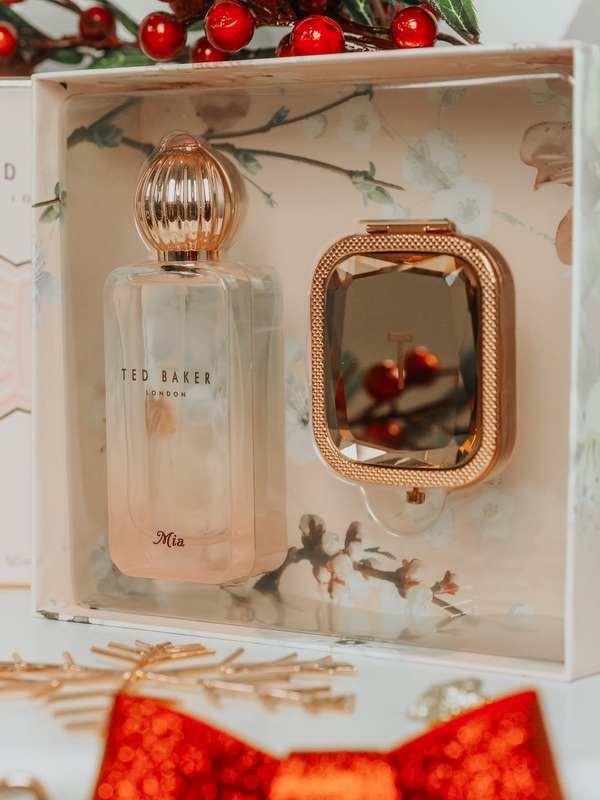 One of my favourite fragrance sets this year has to be their Ted Baker Mia Gift Set, which retails for £30. It comes with not only their gorgeous Mia fragrance, but a cute little compact mirror! For me, this is such soft feminine fragrance, it's both sweet and floral with notes of Raspberry, Blackcurrant, Patchouli and Amber. 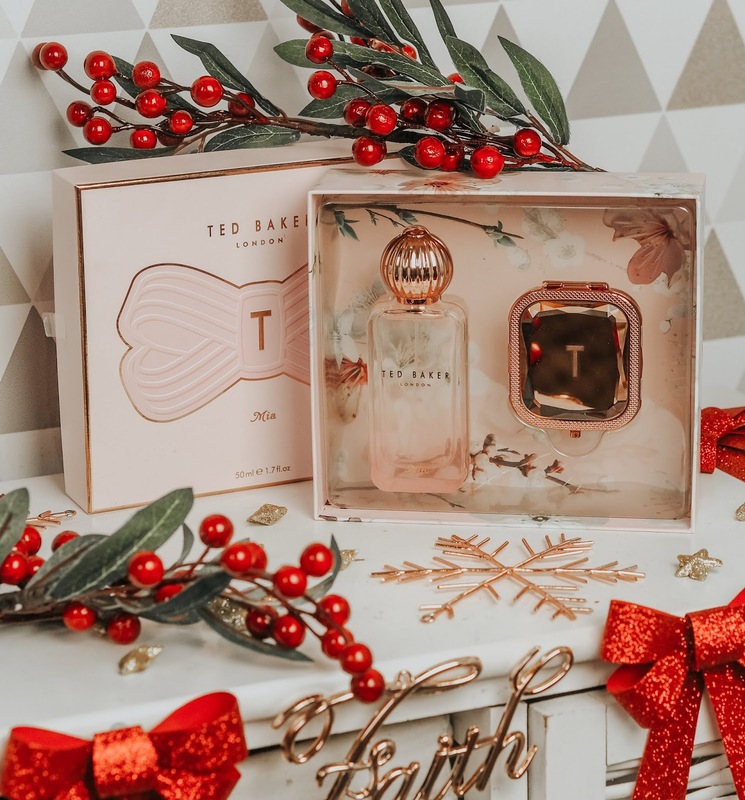 Ted Baker is such a classic brand, that I think this would make a perfect gift for all ages! 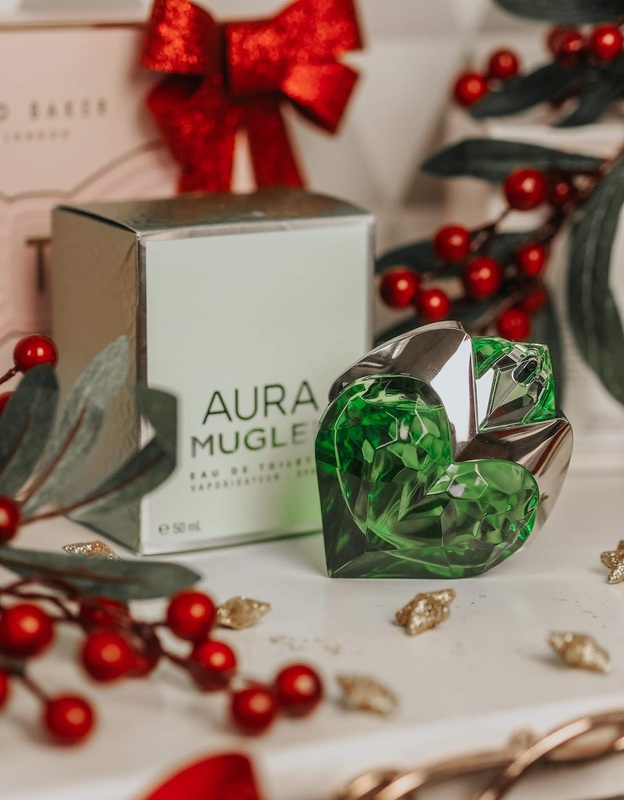 One fragrance that I've completely fallen in love with is Aura Mugler Eau De Toilette. First of all, can we just talk about how STUNNING the bottle is? Out of all the fragrances i've listed in this post, I am most impressed with this packaging! It's so different and unique. This would be something I'd be so grateful to receive at Christmas as it would look gorgeous on my vanity! This scent is all about embracing nature, so it's smells super fresh with notes of Pear, Hibiscus and White Vanilla. Currently, a 50ml bottle retails for around £50-£60 depending on where you purchase from! If you're looking for something more on the fun and playful side, you definitely need to pick up Oui Juicy Couture. With notes of Watermelon, Pear and Dewy Honesysuckle, this fragrance definitely lives up to it's name of being Juicy! This would be a great fragrance to take with you on a summer holiday with your girlfriends, everything about it screams fun, even the bottle! This fragrance retails for £43 for 30ml. I'd never tried any fragrances from Juicy Couture before, but after smelling how lovely this one is, I'm definitely going to look at what else they have to offer! Moving on to another cute little gift set, we have the Boss Babe Gift Set from Missguided which retails for only £28! I've tried one of the Missguided perfumes when they were first released, and I have to say I was very impressed! I love how unique the 'bottles' are, and with this particular set you get a cute fluffy pom pom keychain for your bag. This is a gorgeous fruity floral scent with notes of bergamot, pear and pistachio. This would make the ideal gift for any boss babes in your life! Finally we have one of the biggest fragrance gift sets I've ever seen! 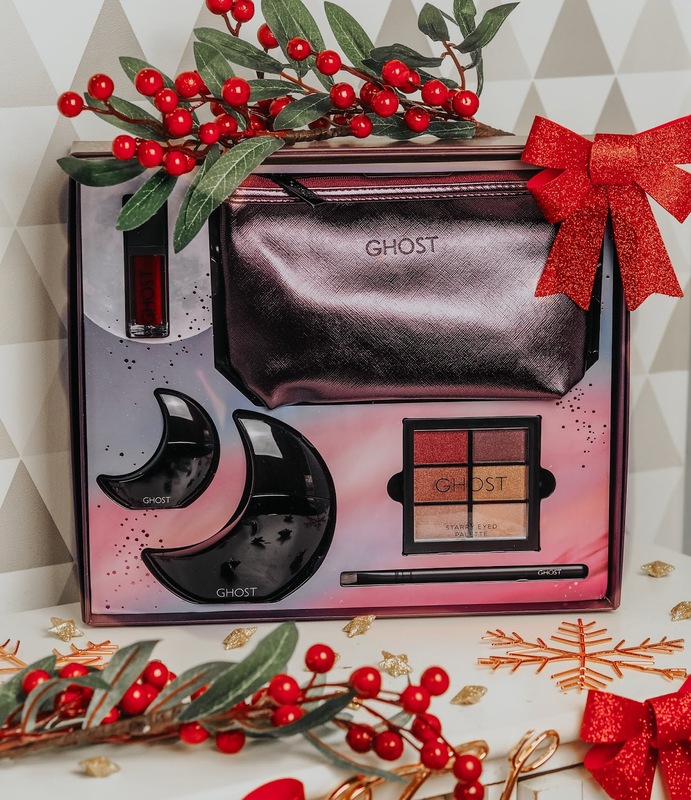 This one is the Ghost Deep Night Gift Set and it retails for only £39 which is amazing value for everything you get! This sensual fragrance is perfect for the evenings, with notes of Indian Rose and Belle de Nuit Flower, which only opens at night! In this set you'll also find a mini fragrance to throw in your bag, an eyeshadow palette and brush, lip gloss and makeup bag. If you ask me, that's an absolute bargain! I love the fact that both the eyeshadow palette and lip gloss are really wearable shades that would be fantastic for creating some festive makeup looks! This is hands down, one of best and most affordable gift sets I've seen this year. So there we have it, those are my top fragrance picks this Christmas! You'll also find a lot of these perfumes and sets are on offer so there's some great savings to be made here too. Which of these fragrances would you most like to receive at Christmas? I hadn't even thought about Ted Baker for fragrance! It sounds like a lovely scent and I love the mirror! oh that aura mugler bottle is so beautiful!! need to try it, some other fab suggestions. All of these bottles are beautiful! I am so curious as to whether you had to purchase all of these fragrances or not. I love the look of the Ted Baker set! You can’t beat a bottle of perfume or a beautiful set as a great gift. I love to receive them. Marc Jacobs perfume has been a firm favourite for many years now! Daisy is one of my favourite scents of all time. I really love it, so it would be a perfect gift for me!